Charley first picked up the guitar at a young 8 years old; he’s been pickin’ and playin’ ever since. Before establishing Medicine Wheel in 2012, Charley was a busy guy! Charley has played in a variety of bands over the years including Stone Soup, Doc Apple, Dexter Grove, RUHA, and the Charley Orlando Band. He has had the great privilege of playing on stage with some great musicians including Peter Rowan, New Riders of the Purple Sage, Merl Saunders, Leftover Salmon, moe., Umphrees McGee, String Cheese Incident, Meatloaf, Kid Rock, Quiet Riot, and many more!!!! Currently, Charley can be found playing his Organica Groove as a solo act and is also performing as the Medicine Wheel Duo with Mike Vincitore. As I said, Charley is a busy dude! But the hard work has been paying off. In addition to sitting in with some cool bands, Charley has somehow found the time to record 14 albums while playing over 3000 shows in North America! During that slate of work, he managed to pick up 28 Grammy Entry Ballot Nominations and was given Honorable Mention for Songwriting by Billboard for his song My Angel. At the age of 10, Mike Vincitore picked up a guitar; the world would never be the same. Mike was attracted to the sound and stayed for the love of music. Mike was playing at the expert level of guitar hero years before the game was even invented! Since learning his craft, he has played in local bands like Red Light District and Earth Jam, as well as many others. Mike is also currently the anchor of local Grateful Dead cover band Dark Hollow. Dark Hollow is THE preeminent Dead cover band in the CNY area! Mike also plays with Charley in the Medicine Wheel Duo. Mike has also shared the stage with a diverse cast of characters including Willie Nelson, Lynyrd Skynyrd, Garth Hudson, Keller Williams, Rusted Root, The Wailers, New Riders of the Purple Sage, Vince Welnick, and Donna Jean Godchaux, moe., Donna the Buffalo, and Max Creek. In 2003, Mike had the opportunity to audition to be Busta Rhymes guitarist. I think we all missed the opportunity of a lifetime by missing the chance to see Mike in corn rows! Mike has also received 2 SAMMY nominations. Well, yes he does. And hopefully you enjoy hearing them! Aaron, “the Professor,” started playing Bass in 10th grade, why? Well, why not? That is the story that led Aaron to bass. After trying to play guitar, the high school jazz band needed a bass player. After going back to guitar in college, the college musical needed a bass player. So back to the bass it was, and that is where he has been ever since, holding down the low end. Over the years Aaron has developed a versatile style based a plethora of influences and is bass fluent on 4 and 5 string basses, fretted or fretless basses, and he can even throw down on an upright when the time is right. 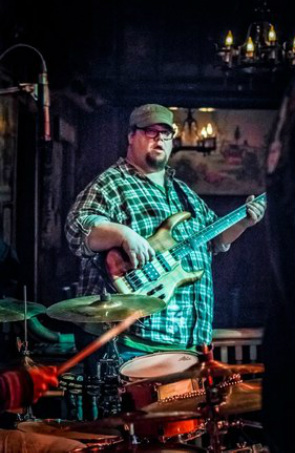 Aaron has played bass in a variety of bands over the years including the Goat Brothers, the Whirling Dervish, Jazzmin, the Sugar Free Jazz Collective, the Narrow Line, and the Herbs. Additionally, Aaron has played in several pit orchestras for local musical productions including Two Gentleman of Verona, Once on This Island, and Avenue Q. In 2011, Aaron played bass on William Nicholson’s SAMMY Nominated albumTime Keepers. In 2012, Aaron played in Avenue Q which has received several SALT nominations, including noms for best musical and music direction. Aaron has been playing in rhythm sections with Marc for a long time and is current in local rock band Dopamine with Stell. Additionally, Aaron is currently sitting in Dark Hollow on an interim basis with Medicine Wheel guitarist Mike Vincitore. In 1985, at the tender age of 10, Marc picked up a pair of drumsticks, put on a pair of sunglasses, and started hammering out the tom part in wipeout! Although it probably wasn’t pretty when he was 10, those tom rolls developed into a well-rounded drummer extraordinaire! Since 1991, Marc has been bangin’ the skins for a variety of local, national, and international (OK, well German) bands. 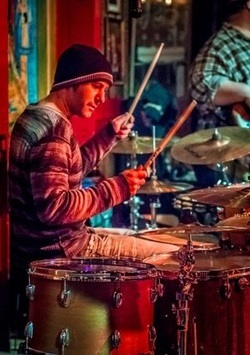 Marc attended Berklee in Boston where he trained with some top notch drummers. Marc has appeared in local acts like the Whirling Dervish and the Sugar Free Jazz Collective and has played drums in, programed for, and produced many projects ranging in style form jazz, pop, art rock, and electronica though out the Northeast, Los Angeles and Southern California, and Germany. In addition to playing in Medicine Wheel, Marc is also drumming in local rock band Dopamine and is tending to is electronic music project Surene. Well, that’s two things, but he is a drummer after all!